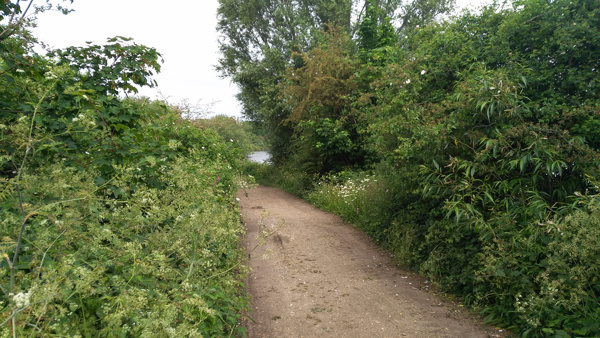 I was on a guided tour of the Walthamstow Wetlands today, a huge area of 10 historic reservoirs that has long been the preserve of fishermen, birdwatchers and water company workers, that is about to be turned into a large, publicly accessible nature reserve. The area is near to the Woodbury Wetlands, which similarly was a largely unknown area of water and reeds that has now been opened up, the guest of honour at the opening ceremony last month being none other than Sir David Attenborough. 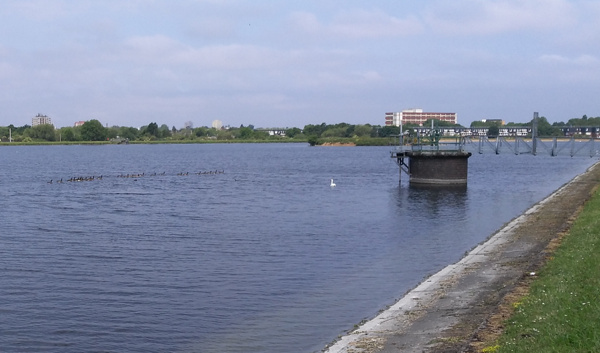 However, Walthamstow Wetlands is ten times larger, and the London Wildlife Trust, who are delivering the tranformations in both areas and led today’s tour, describe Woodbury Wetlands as just a “dress rehearsal” for the Walthamstow Wetlands area, which is 6 times the size and is due to open in 2017. It will be far and away the largest area of wetland habitat in London and one of the most important in Europe. The area is already teaming with birds, other animals, and wildflowers, and some early signs of the conversion are already in progress, compared with my previous visit a few years back. 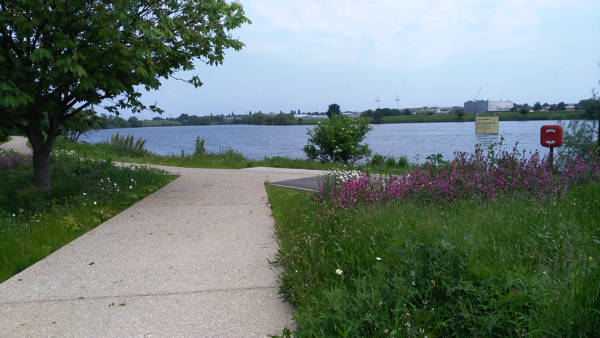 The surface has been laid on a new walking/cycling route that will run the length of the reserve, with two new entrances being created at either end to complement the only current access which is from Ferry Lane in the middle of the reserve. 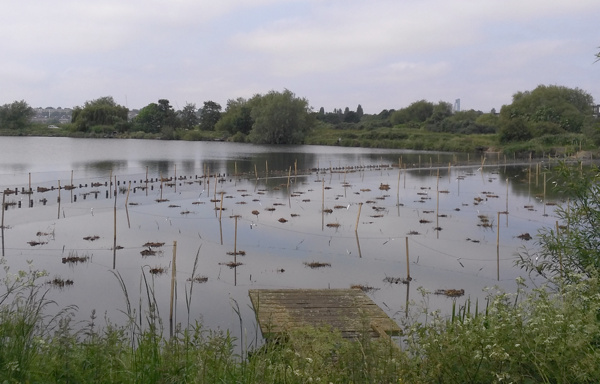 Several areas have been fenced off in the Reservoirs 1, 2 and 3 – the earliest, hand-dug and shallow ones, the aim being to turn these into areas of reed beds to encourage bitterns back into the area. The two main islands, Heron Island and Cormorant Island, are full of their respective birds – the latter island being largely bare of vegetation and full of the squarking animals. Other wildlife spotted included a variety of geese and ducks (some as families), some large fish (the area is a major spot for angling) and many dragonflies. Also, somewhat less fortunately, there was a grass snake near the entrance – run over and squashed presumably by estate traffic. Plans include complete renovation of the historic engine house in the middle of the site, to act as the main visitor centre, cafe, exhibition and an education facility. The house will have part of its tower rebuilt with hollow bricks, to encourage skylarks to nest. The renovation is well underway with the building gutted and in scaffolding. Various bits of machinery from its days as a pumping house will be retained, although the main pump itself was removed many years ago. At the southern end of the reserve, the central part of the Coppermill building will have a lift added, allowing access into the tower for a great view over the reserve. The look of the building will be carefully preserved, this means the lift will not make it to quite the top of the tower. Access to the reserve, centre and viewpoint will all be free. Possible future plans, subject to the success of the reserve and its ability to be self-funding following opening, will be a second small visitor facility being built in the rest of the Coppermill building, which, for now, remains a storage site for Thames Water. Top and second: Preparation of the new reed beds. Above: One of the tracks through the reserve, which has had bracken removed and has been planted with wildflowers to encourage different kinds of birds. Below: Geese and a swan on another of the reservoirs. Bottom: Looking from Ferry Lane into the north part of the wetlands, which was not part of today’s tour. There is more information about the project on the official website. There’s currently a great deal for Londoners who are keen to see the city from the highest viewpoint possible. The View from the Shard currently has a “Love London” pass for sale for just £20.16. This gives you unlimited visits between now and the end of the year – not bad if you consider that, for on-the-day visitors, the regular tourist price, for ONE visit, is £31 (or £26 if you book in advance). Even if you only visit every couple of months between now and December, that still works at £4 per visit. Go half an hour before sunset, go at night, go in the morning on a sunny day, go when the garden opens in mid-June, and go during heavy rain or a lightning storm! On my second visit I missed a big one by just a few minutes. To get it just turn up, buy the pass and then get a ticket for a visit, there and then. The pass is credit-card sized, and digitally stores a photo of you to check against swapping of the card. There’s only a limited number of the cards left, you can only get them from the ticket office in the Shard (open until 9pm every day). You’ll need both photo ID and proof of (London) address to get the pass. For subsequent visits you just flash the pass at the ticket desk and get a ticket. At the time of writing, there are currently “a few” left, the staff are cagey about how many, but a few thousand (2016 + 500 + X?) have been sold so far. Give your ticket to an attendant who swipes it to open a gate. You then have an metal-detector gate to go through, with your bags/pocket contents X-ray scanned. You then get a couple of green-screen photos of you taken (so don’t wear green! ), one looking forwards and the other looking up. You get handed a card (to later retrieve the photos to view and/or purchase). You get given a small PDA containing a guide to the view you are about to see, with optional audio narration. Down a corridor into a lift to Floor 33, the 30 second journey augmented by a vivid animated display in the ceiling. Then, an usher shows you around he corner to the second lift, another ceiling visual and 30 seconds later you are on Level 68. Just about there! There’s a little shop at Level 68, but go straight up the stairs to Level 69, the indoor, and largest, of the two viewing platforms. You made it! The building beams cast a reflection on the glass panels which is surprisingly strong but an hour before sunset they turn off the inside lighting, which helps, and after dark it is not a problem. There are also free (yay!) digital telescopes arranged around the edge (press the button on the left to get the live view, which unfortunately does not zoom in as far as the historic image views – take your own binoculars or telephoto lens, if you are trying to spot your suburban home!) The photo at the bottom of this post is the first view you see – looking to the south. It’s the least exciting direction, but is still visually striking. N.B. In this photo, on the top of the building at the bottom, which is itself a 25-floor skyscraper (Guys Hospital), you can spot Wally on the roof. He is there for a few more days, as part of an aerial I-spy. Up three more flights of stairs to get to Level 72, the outdoor platform (though it still feels enclosed as there is glass above head-height, and the core behind you) which also hosts a Champagne bar. The floor is wooden decking, and partially under cover. Don’t forget to look up from this level, in the corners. 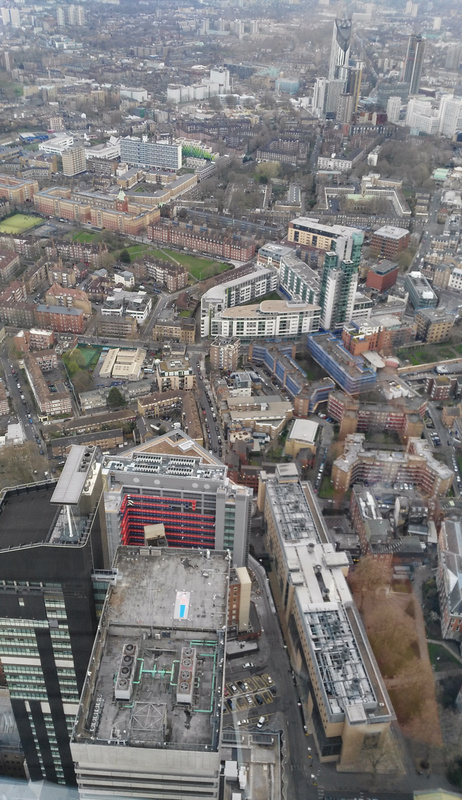 Here, the view is more open, and you can see the rest of the Shard heading up for a further 17 floors, as it tapers to a point – see the photo above. There is also a further set of stairs up, tantalisingly off-limits to visitors. The View from the Shard is definitely worth the trip, if you live in London and plan a few visits this year. It’s high enough up (the platforms are nearly 300m) up to give London a “Sim City” (or, at night, “Blade Runner”) feel, and a view which appears to cover the whole of London and – thanks to the continuous urban extent right to the horizon – makes the city look truly huge, in a way that maps, lower viewpoints and aircraft views (too high) don’t achieve. …oh, and if you need another reason to go, there’s a nice floor map in the sky lobby, half-way up to the top. Thanks to Diamond Geezer for tipping me off about the Love London cards. To aid virtual exploration of the twelve possible “High Line” elevated walking routes in inner-city London, that I’ve highlighted in my series over the last couple of weeks, I’ve created this map on Google Maps, showing the extent of each of the twelve routes. 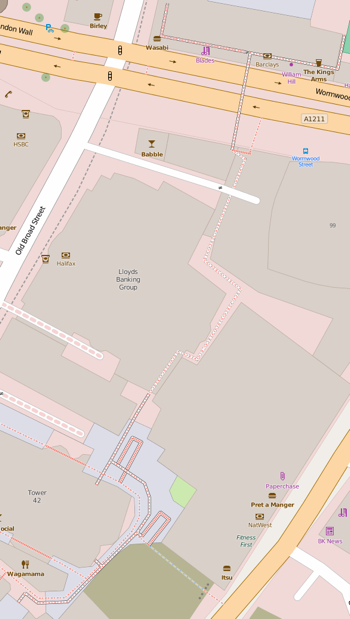 See a larger version of the map here, which you can explore using aerial imagery and “Street View”. Over the last two weeks I have featured eleven potential London High Lines (see all the previous ones here) – all of them could be interesting place but none of them quite have the potential to be a London “High Line”. Today, my final London High Line, is the one that I think ticks all the boxes. It runs through post-industrial gritty inner-city London, it’s elevated, it’s an old railway route, and the land is just lying there, undeveloped. 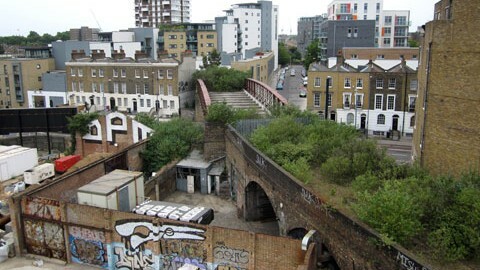 It is the Camden High Line – a potential High Line that runs between Camden Gardens Park (just off Kentish Town Road), around the back of Camden Road station, across a number of intact, unused bridges and finishing at an existing footbridge across the Midland Mainline, just past Camley Street. In all, a distance of around 800m (half a mile), with a possible Phase 2 future extension across to the huge and evolving development area behind King’s Cross station, although this additional section would require the building of at least one footbridge. 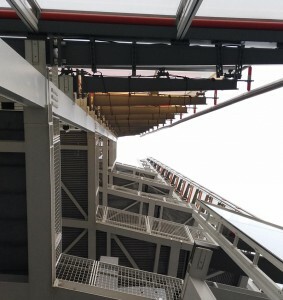 This would likely need the most expensive new structure – a lift with a surrounding staircase, to allow step-free access onto the route from the western end. It would also need to use a small section of the public park here – Camden Gardens Park – for the lift/staircase to “land”. The route would then move quite quickly away from the current line, using the disused (and now heavily overgrown) section behind Camden Road station – another possible access point and one that could provide an alternative step-free entrance using the existing lift there, from the eastbound platform (ticket barrier location notwithstanding). The route continues along the former double-track, alongside the existing double-track between Camden Road and Caledonian Road & Barnsbury, walled off safely but with plenty of space available for the High Walk itself. Shortly, a couple of other bridges are crossed. One crosses over at a road junction. There is plenty of pavement below the bridge here and so this is a potential landing location for a staircase (possibly spiral) for an intermediate entry/exit to the walk. The route continues eastwards, narrowing quite a bit near the end at the final bridge across Camley Street although still with plenty of space beside the operational railway for a path and appropriate screening from the operational railway. There is a choice of endings at the eastern end. There is already a (pretty unpleasant and unsafe feeling) set of steps down from the western side of the Midland Mainline existing footbridge. This could be remodelled and made safer. At the bottom is the northern end of Camley Street, a light industrial estate, with an existing pedestrian link north to Agar Grove, and a quiet road south that leads to the Regent’s Canal – from there, King’s Cross Central is nearby. 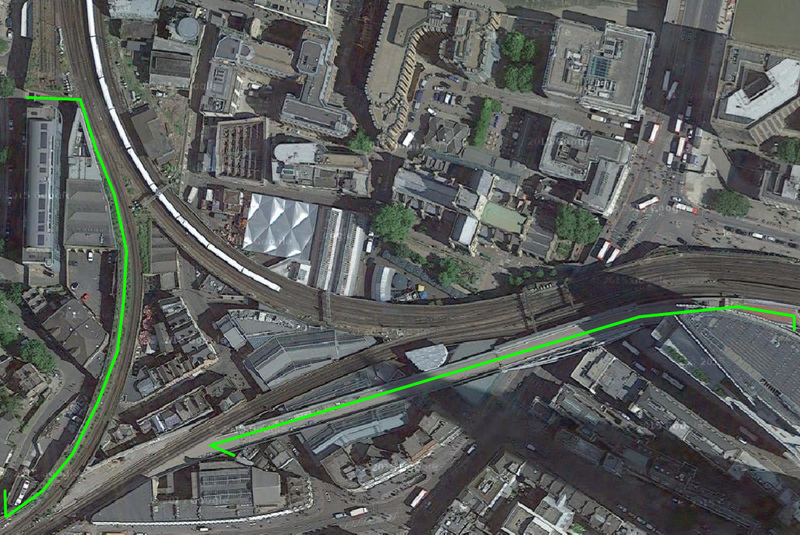 Alternatively, continuing along the road eventually leads to St Pancras International station. The second ending is a level access from the footbridge crossing the Midland Mainline – at its eastern end, paths head north and then northeast, connecting to Agar Grove and eventually Caledonian Road. This has the benefit of providing a step-free end to the walk, so that, unlike at the western end, a lift would not be necessary. This would connect the eastern end of the Camden High Line, southwards to the huge mixed-use King’s Cross Central redevelopment and Central St Martin’s College, behind King’s Cross station. Such a route would require crossing over (or under) the existing North London Line, and various other lines emerging from St Pancras, with at least one footbridge needed – as such it would be an expensive exercise. 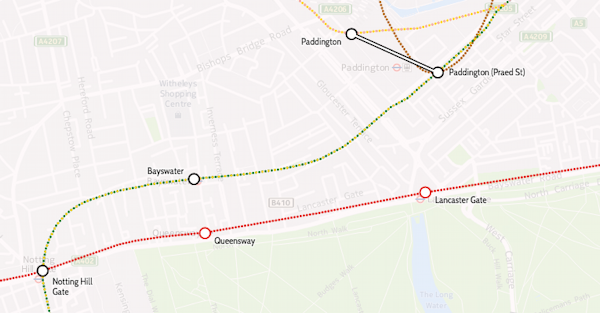 I’m just mentioning it here as having a complete “High Line” link running all the way between, Camden Town and King’s Cross, to parallel with the Regent’s Canal route to the south of it, seems like an obvious route between two major north London walking destinations. So could it happen? Well, the viability of the project would depend on Network Rail reliquishing its land, on support from Camden Council, a fundraising effort to fund a feasibility report and build the actual trail, and on the creation of a local trust dedicated to maintaining such a route once it opened on a largely voluntary basis, like happens on the New York High Line. In short, it wouldn’t be easy, but it is certainly very possible. 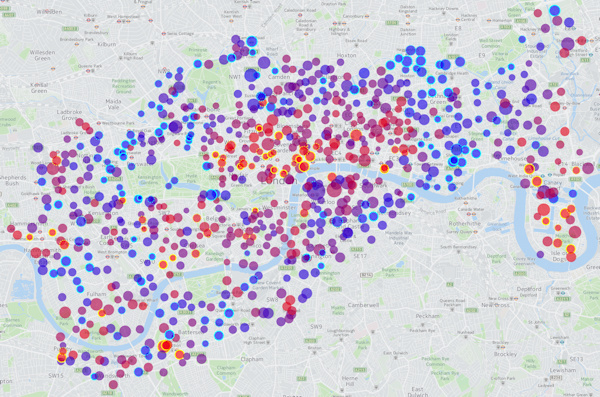 See all 12 of my London “High Lines”. Photos from Google Street View and Google Aerial Imagery. Map from OpenStreetMap (Data ODbL, cartography CC-By OSM contributors). Subsequent to first publication, I’ve renamed this blogpost from “The Camden Line” to avoid confusion with the MARC Camden Line rail commuter line in Maryland, USA. This new railway bridge got lifted into place a couple of years ago. Eventually, in 2018 or so once London Bridge Station has been rebuilt, it will form the dedicated tracks between this station and Charing Cross, with the old bridge going to just Blackfriars, rather than to both at the moment. But that’s a few years away. At the moment the bridge is empty, and just used for storage. How cool would it be if you could walk straight from the concourse in front of London Bridge Station, to Borough Market, without having to cross Borough High Street? A couple of scaffolded staircases would allow for such a possibility, even if it was only for a couple of years. 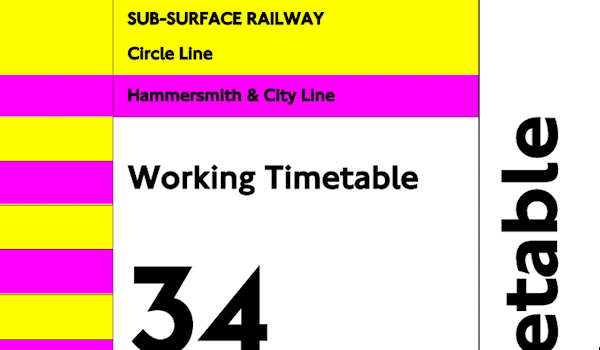 There is also potential for using the track that curves westwards from Cannon Street to Charing Cross, as no scheduled train needs to use this curve. However there is still a single track here, which is used as a siding after the morning rush-hour, so, although there is enough room for a path alongside, it’s (even) less likely that this would ever become a High Walk for the public. Top photo: Steven Craven on Geograph. Aerial image from Google Maps. The Barbican is a huge 1950s/60s housing development in the “raw concrete” Brutalist style which divides opinion (personally, I love it). The concept of the Barbican is having the pedestrian level on two “podiums” 4-6 metres above the car/street level, entirely separated from traffic. Connections between the podiums and the street level, and between different parts of the estate, are via “Highwalks”. These walkways in the sky are in fact legally considered public streets, and if you are familiar with the geography of the Barbican, are a pleasant way to pass through part of the City without encountering traffic. The Highwalks are shown as orange lines on the estate map below. 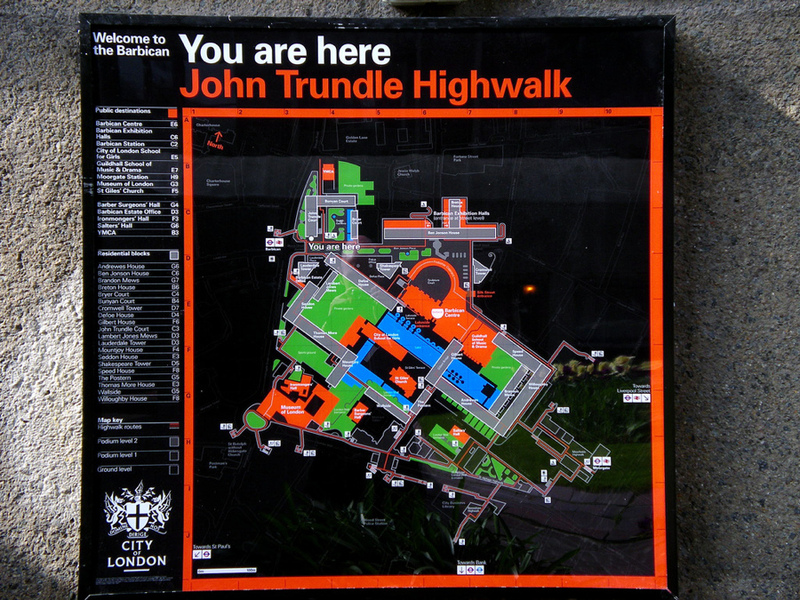 Some have actual orange lines painted on the ground, these are to help visitors, who are unfamiliar with the complex 3D nature of the walking routes in the area, to make it to the Barbican Art Centre – by following an orange line from an entrance to the estate, you should find your way there. One of these orange lines can be just made out on the far left in the photo above. 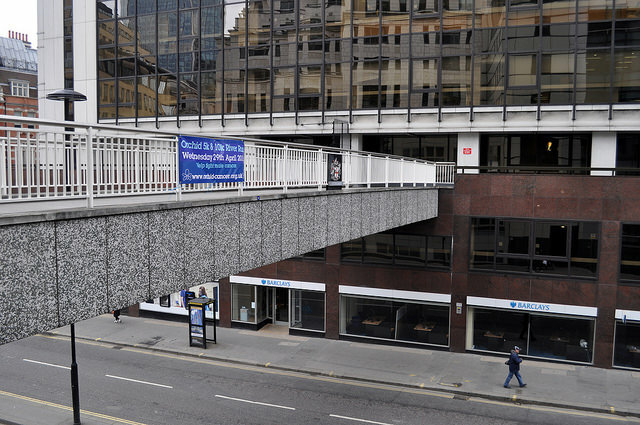 One section of the Highwalks near the Barbican that has recently disappeared, is a triangle of land near London Wall, that used to connect the predominately residential Barbican to the Guildhall. This has recently been demolished for a new complex of office towers, London Wall Place. Thankfully, the raised sections will be coming back, as a nice looking long bridge, passing through the new buildings and restoring the connection between London Wall, the Barbican’s own network of Highwalks and podiums, and the Guildhall and rest of the City. The temptation these days, surely, must be to improve the pedestrian realm at street level, as ultimately that’s where people want to be, but it’s good to see that, in this case, the “first floor” pedestrian level will live on, as a route from which to observe the buzz of the city below. Map: Phil Gyford. Bottom photo: London Wall Place. 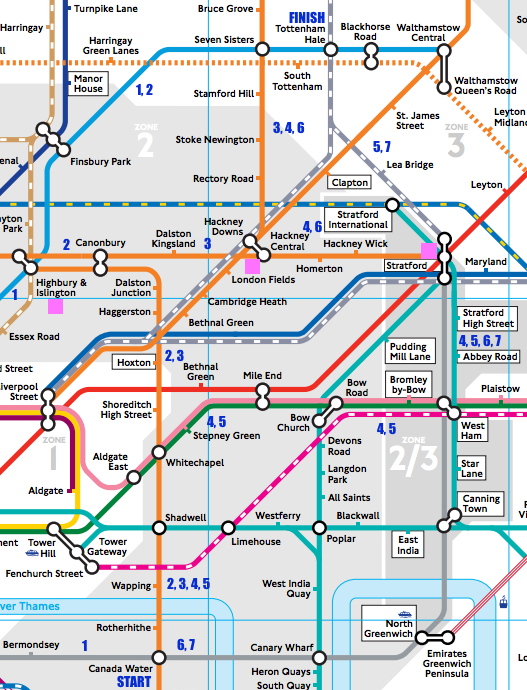 This is one in a series of posts about possible High Lines for London. See the full list here including the one with the best potential. The Limehouse Curve lies just east of Limehouse station in east London, it used to be a link between Stratford/West Ham and the Isle of Dogs/Blackwall. These days only a short section remains, around half of the curve itself, running from the DLR viaduct at the eastern edge of Limehouse Basin, and crossing Commercial Road, beyond where a line of apartments stands. The link is short (120m) but it is raised, and through an appropriately gritty part of the post-industrial inner city. 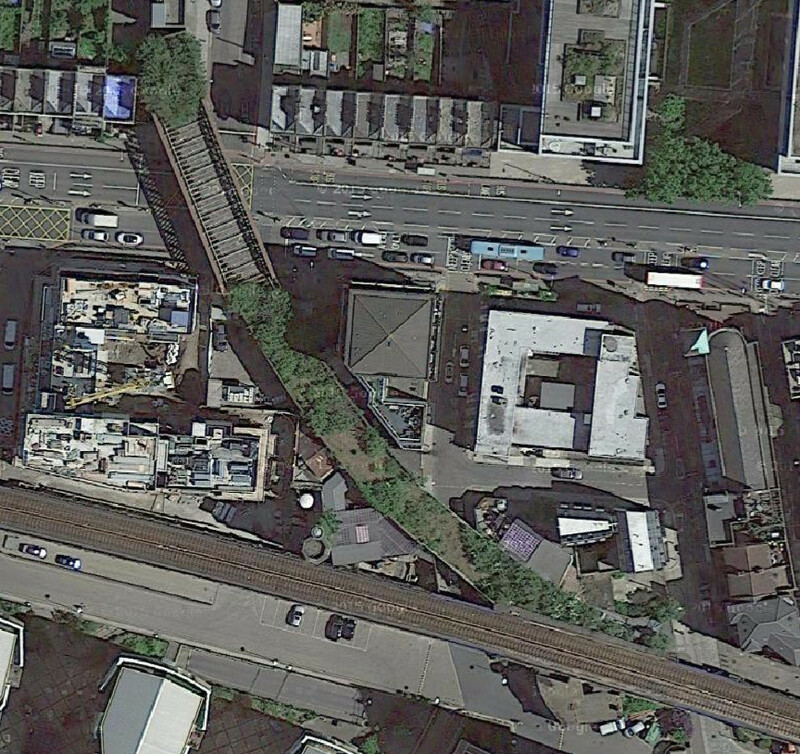 There are two bridges that are solely part of the disused route (both seen below in this wide-angle Google Street View image), plus a third which is shared with the existing DLR route, beside which a wooden decking and descent down to street level could be assembled – although step-free access, likely a prerequisite for any funded project, would be very tricky at this end. There was a tentative project a few years ago to create connections at either end and make it a short walkway and linear park, but sadly nothing came of it. However, the route remains, including a potentially useful bridge across a busy road. Maybe one day it will live again. Top photo from What If. Bottom photo and aerial imagery above from Google Maps aerial view.